The RAISING of the normal boiling point of a liquid by adding a non-volatile substance to it. When you add non-volatile solute to a pure solvent, the boiling point of the liquid solvent is elevated. This means that the solvent will now only boil at a higher temperature. The reason is because the non-volatile substance or solute becomes a hindrance like a weight pressing down. The solvent particles will need a lot more energy to bounce upwards and push the solute particles out of the way and eventually escape into the atmosphere. In order for the solution to boil, the vapor pressure (upward pressure) has to reach an equal force to the atmospheric pressure (downward pressure). 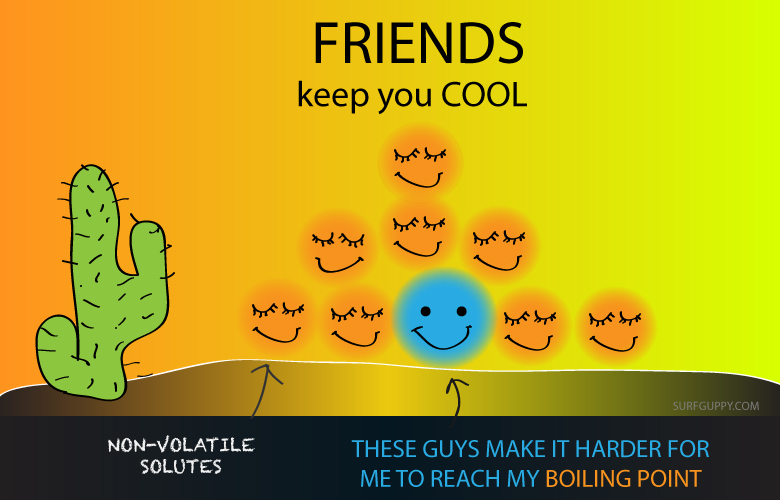 Thus heating the solution to a higher temperature is necessary to bring the solvent to a boiling point when you have to overcome both solutes and atmospheric pressure. So you can also calculate or predict the boiling point of a solution if you know the constant(kb) and molality(M) of the solution. 30.0 g of glucose (C6H12O6) dissolved in 600 g of water.